Five Guys Famous Burgers & Fries has obtained $15,000,000 Series A Preferred Stock. 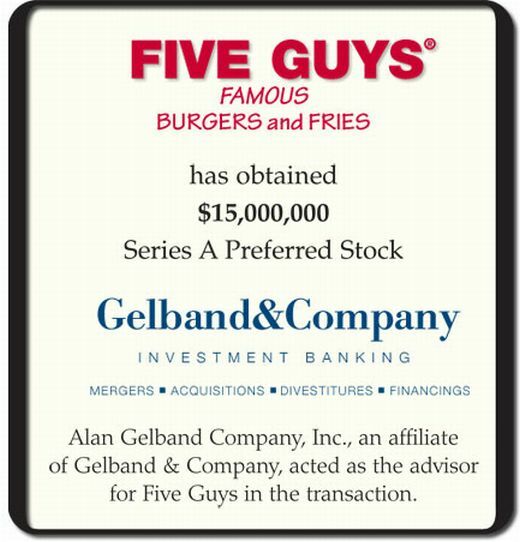 Alan Gelband Company, Inc., an affiliate of Gelband & Company, acted as the advisor for Five Guys in the transaction. Michigan University wrote an article about Five Guys transformation from a small group of local restaurants to an international franchise. The article also describes Gelband & Company's role in helping Five Guys Famous Burgers and Fries secure funding for the venture. Gelband & Company Inc. is pleased to announce it served as financial advisor for Metro Franchising Commissary, LLC "Metro" and its related entities. The Investor was Quilvest Private Equity, an International Investment Firm that has participated in more than $5 billion in transactions over the past 30 years. The relationship will support the growth plans of Metro as they build additional Dunkin Donuts locations. Commenting on the transaction, Stuart Cohen, the CEO of Metro said "Over the years we have had many investor groups interested in investing in our company, but Alan Gelband found a world class Investor who really understands our business, appreciates the growth opportunity and will support our efforts going forward. Throughout the process, Alan was always available to provide the guidance and advice we needed." The Management of Big Lake Services, Inc. together with Alan Gelband and Capital Point Partners, have purchased the assets of Big Lake Services, Inc. A new company named Big Lake Services Co Newco, Inc. was formed. Gelband & Company structured the transaction, acted as advisor to management, and raised the capital. Capital Point Partners provided mezzanine financing and Citibank NA provided the senior term debt and a revolver. About Big Lake Services Co Newco, Inc. (BLSCO NewCo): BLSCO Newco is an oil services company located in Midland, Texas. The company specializes in service rigs used for oil well maintenance and currently has 11 workover rig pulling units fully deployed and in operation throughout the Permian Basin area. Such rigs are used for virtually all downhole services, repairs, and completions. $30,000,000 has been acquired by Medallion Financial Corp.
$10,000,000 has been acquired by Aida Services, Inc.
$6,000,000 has been acquired by Figure Flattery, Inc.